The wolfpack is back and getting into crazy shenanigans once again. “The Hangover” was a box office smash in 2009, so naturally Warner Brothers wanted to cash in on a sequel. And the new full-length trailer for the follow-up promises more memorable bachelor party moments for our favorite drunken trio. This time around it’s Stu’s (Ed Helms) turn to tie the knot, and the gang jets off to Bangkok for the wedding. Some things haven’t changed a bit, like Alan’s affinity for awkward toasts (“There was a whore in Las Vegas a couple of years ago …”). Some things have, like Mr. Chow (Ken Jeong) actually wearing clothes. All Stu wants is a calm bachelor party brunch with pals Phil (Bradley Cooper), Alan (Zach Galifianakis) and Doug (Justin Bartha), but somehow they wake up with another massive hangover and Stu, Phil and Alan have to piece together what happened. Their hijinks lead to Alan shaving his head, Stu getting a large facial tattoo and the gang somehow acquiring a monkey in a tiny jean jacket. Sure, “The Hangover Part II” uses the same basic bachelor party premise as the first film, but I’m still excited to see what situations the guys find themselves in abroad. I loved the first movie because of the great chemistry among the leads, and based on the trailer it looks like that’s still the focus in the sequel. Watching those three be funny together again is enough for me. 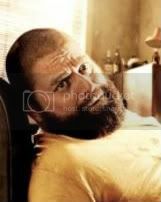 “The Hangover Part II” stumbles into theaters May 26. Are you excited about the sequel, or was one bachelor party with Stu, Phil and Alan enough for you? Sound off in the comments section. Yes, I was worried when the teaser poster and trailer came out because the same guy that was missing in the first film was excluded in them and I thought they were going to lose him again. I am relieved to know that they lose somebody else. If the situations and writing is anywhere near the caliber of the first film it will be hilarious I’m sure! It almost looks too much like the first one. I kind of feel like I already saw this movie. I didn’t like the first one all that much (because of the hype). I think I may skip this one altogether.